As in previous years we will be meeting in The Great Western on Saturday for a few pre-match 🍻 🍻 🍻 We hope to see you all there! I f you are making the journey to Northampton on the 9th of December, the Ospreys Supporters Cub will be meeting in the Thomas A Becket pub located on St James Road and only a short walk from the ground. We have met up at this venue on previous trips to Northampton and have always enjoyed a warm welcome. Based on site in a heated marquee, there will be a Guinness Village open from 1:30pm on match day. There is a full outdoor bar and street food available to purchase through to 8pm. Entertainment in the form of a live band is put on in the Guinness Village from 7pm. In addition to this, pub food from the main menu is served between 12pm and 6pm. The Thomas A Becket is a rugby pub and all televised games will be shown on their screens. There is also a screen located within the Guinness Village. The pub sells six varieties of real ale from local and national suppliers, plus a range of craft beers. Real ale lovers amongst you who are members of CAMRA can enjoy a 30% discount. We look forward to seeing you there before our game at Franklin’s Gardens on the 9th. Bookings are for groups of 10+, and the Scarlets Cmmunity Team aim to collate forms and sit groups of Ospreys supporters as close together as possible, (we expect this to actually be in the stadium!). Also if you do have some small groups i.e 2/3/4s etc, you are welcome to also complete and use the forms as the Scarlets Community team will keep them and add them to bigger groups so that you can also qualify for the reduced price tickets. Click here for OSC travel details. We have been in contact with the Saracens supporters club and they have kindly asked travelling Os supporters to join them for a pre match meal. A reservation has been made in the Metro Italia Mill Hill for 5pm on the Saturday. If you are interested in coming along then please email sarah@ospreyssupportersclub.com . It is just a short walk from the ground. If you are interested in just a pre match drink, then we will be congregating in the Sarries supporters area located between the north and east stands. Who knows! Mill Hill RFC pie and a pint? 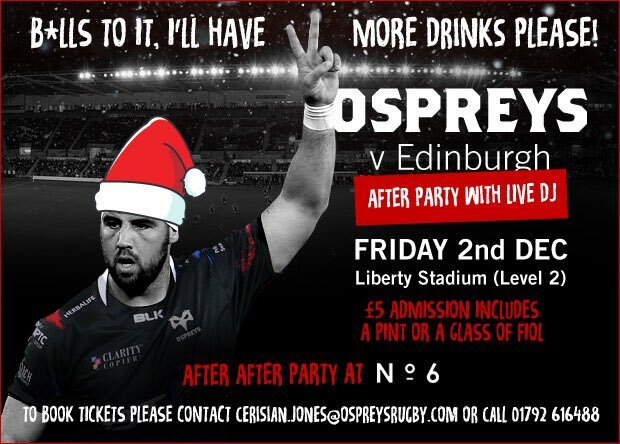 The Ospreys are putting on a party post match at the Liberty! Contact the cerisian.jones@ospreysrugby.com or phone 01792616488 to book tickets. 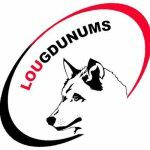 We’ve been in contact with Lyon’s supporters club Les Lougdunums and arranged a meet up on Friday evening with them. They have arranged to meet us at 9am at the Ninkasi Gerland which is near a subway stop. A brewery, bar menu, live music…..looks good so see you there! Are you travelling to Lyon? Trying to estimate numbers to pick a pub! Here’s a montage of our stills and video from the 2016-17 Ospreys shirt launch. BLK have delivered the goods again! Oh, and the day was topped off with a 26-21 friendly victory over the Leicester Tigers. 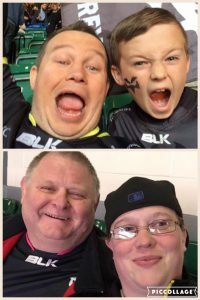 Congratulations to Lloyd James and Danielle Turner-Jenkins who are the winners of our #CheersWorthingtons selfie competition! Thank you to all those who sent in their entries. A final THANK YOU to Worthington’s for providing the coaches on Saturday. They were a huge success. So you are not one of the lucky ones going to support the lads away at Exeter and are wondering what shall I do and where shall I watch the game. You are probably thinking I don’t have BT Sport or wouldn’t it be great to watch with a bunch of other supporters. Well now if you don’t have BT you can watch the game with like-minded supporters as we have teamed up with The Pavilion (click here to view their website) who will be showing all European Rugby Champions Cup away games for us. This is a great venue, situated halfway between Neath and Swansea. It has plenty of parking if you wish to drive or if not you can get a train to Neath and taxi over for around £5. 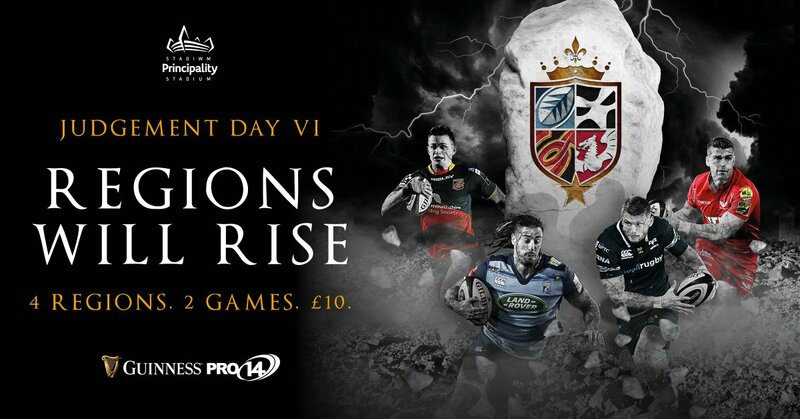 It has everything you need, it is family friendly has several screens to watch the game, fabulous food and of course a well-stocked bar and as an added bonus all season ticket members will receive 10% discount on their food bill (drinks excluded), so ensure you take your season ticket with you. PLEASE NOTE THAT THERE IS NO PARKING AVAILABLE AT THE LIBERTY STADIUM DUE TO THE FOOTBALL BEING HELD THERE THAT DAY. We will be departing one hour after final whistle approximately 4:45pm. Please ensure you are there for the pick up time as we want all parties on the coach ready for the departure time. We are on a strict time schedule and will not wait for any late parties. The early pick up times are due to the traffic issues around PYS on this date and so need to ensure we have sufficient time to get there before the game.